Hemifacial hyperplasia is a rare condition causing unilateral enlargement of all tissues. We report a case of progressive facial asymmetry caused by congenital infiltrating lipomatosis of the face in a 6-year-old boy. The approach to diagnosis in our case is discussed along with a review of cases reported in the literature. A 6-year-old boy was referred to our Department from a private dental clinic regarding a painless swelling in the right middle and lower third of the face. The swelling was noticed by parents at birth and was gradually increasing in size with age. Patient did not have any difficulty in speech or loss of hearing. There was no other relevant history. On general physical examination there was no abnormality but extra oral examination revealed gross facial asymmetry due to a solitary diffuse swelling of the right side of the face extending supero-inferiorly from a ala tragal line to about 2 cm below the inferior border of the mandible; mediolaterally involving the whole width of the face on the right side [Figure 1]a and b. Borders were indistinct and the skin over the swelling was normal. On palpation there was no increase in surface temperature, swelling was soft, non tender, non compressible, non pulsatile, non fluctuant with positive transillumination test. No signs of paresthesia or anesthesia were noted. There was deviation of the chin towards the left, enlargement of the lower lip on the right side [Figure 1]a and proportional increase in size of the right auricle as compared to its left counterpart [Figure 1]b. Temporomandibular joint (TMJ) was normal. Bilateral solitary submandibular lymph nodes were palpable were approximately 2 × 1 cm in size, mobile, firm in consistency and non tender. Intraoral examination revealed accelerated dento-skeltal growth on the right side. Teeth preset were: 16 15 14 13 52 11, 62 63 24 65 26, 46 45 44 43 42, and 72 73 74 75 36. Calculus deposits were also more evident on the right side [Figure 2]a and b. The child did not show any significant malocclusion. Ipsilateral macroglossia noted with deviation of the tip towards the left and mild enlargement of the fungiform papillae [Figure 2]c. Oral mucosa appeared normal except for an ill- defined solitary swelling of 1.5 × 1 cm diameter, on the right retrocommissure. It was soft, non pulsatile, non fluctuant and non tender. Based on the clinical findings, a working diagnosis of 'congenital hemifacial hyperplasia of the right side' was formulated. Differential diagnosis of congenital infiltrating lipomatosis, lymphangioma and vascular malformation were considered. An orthopantomograph [Figure 3]a showed enlargement of the right mandible with increase in the ramus length on the affected side and congenitally missing 31 and 41. A posteroanterior cephalogram [Figure 3]b was used to assess the facial asymmetry using Grummon's frontal asymmetry analysis  , which revealed osseous hypertrophy of the right maxilla and mandible. No significant alteration was seen in the proportion of the facial height. The occlusal plane was seen to be canting up left. Menton was shifted to the right with increase in the ramus length on the same side and in the mandibular body length on the left side. Routine blood investigations were within normal limits. Ultrasonographic (USG) investigation showed multiple hypoechoic regions. Color Doppler showed no increase in the vascularity. However, the exact delineation of the extent of the lesion was not possible. Hence, patient was subjected to a computed tomography (CT) scan employing 5 mm serial transaxial sections. Brain parenchyma showed normal attenuation values. The lesion appeared as areas of hypoattenuation similar to adipose structures. Hypertrophy of the bones of the right side of the face was noted [Figure 4]. A final diagnosis of congenital infiltrating lipomatosis of the right side of the face was made. Oral prophylaxis and restoration of carious teeth was carried out. The right buccal mucosal swelling could be considered as mucosal neuroma. Since the patient did not present with any severe disturbance of function, and also knowing the infiltrative nature and associated recurrence rate of the condition, no invasive procedure was performed. The patient will continue to be under regular clinical follow-up until the stabilization of bone growth, when he will be referred for restorative cosmetic surgery. Non-encapsulated congenital fatty tumor containing mature adipocytes. Infiltration of adjacent muscles and soft tissues. Absence of lipoblasts and malignant characteristics. Presence of fibrous elements with numerous nerve bundles and vessels. Since then more cases of this entity have been described in the literature [Table 1]. Congenital lipomatosis involving localized areas of the head and neck have also been reported. 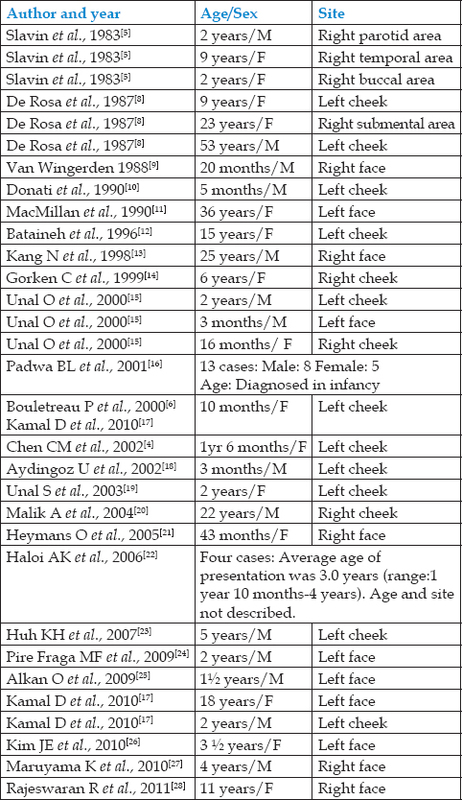 As inferred from the [Table 2], majority of the cases are diagnosed within 2 years of life with the age of presentation varying from 3 months to 53 years. No gender predilection is noted. Slight predilection for occurrence on the left side is noted though our case affected the right side. CIL-F is a disorder that typically presents itself at birth or in early childhood as a unilateral swelling of the cheek with ill-defined borders. Though congenital, it is not hereditary. Patients show a progressive increase in the size of the swelling with a prominent soft tissue enlargement. Bony asymmetry is found to become more prominent with age. The rest of the clinical examination is normal, with no trunk or limb anomalies. The swelling infiltrates muscle and soft tissues, making excision difficult and recurrence likely. However, it is proved to be a completely benign lesion with no evidence of malignant transformation. We recommend that, in the presence of typical history and clinical features, the young patients need not be subjected to extensive invasive procedures as the significant scarring and trauma to the pediatric patient from multiple surgeries is devastating. Diagnosis can be established by examination and radiological findings. The patient can be kept under regular observation until the stabilization of bone growth, after which he can be referred for cosmetic surgery. Lawoyin JO, Daramola JO, Lawoyin DO. Congenital hemifacial hypertrophy. Report of two cases. Oral Surg Oral Med Oral Pathol 1989;68:27-30. 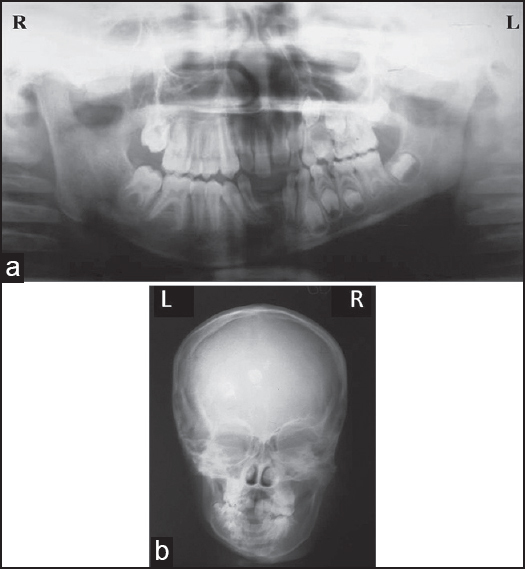 Cohen MM Jr. Perspectives on craniofacial asymmetry: The biology of asymmetry. Int J Oral Maxillofac Surg 1995;24:2-7. Grummons DC, Kappeyne MA. A frontal asymmetry analysis. J Clin Orthod 1987;27:448-65. Chen CM, Lo LJ, Wong HF. Congenital infiltrating lipomatosis of the face: Case report and literature review. Chang Gung Med J 2002;25:194-200. Slavin SA, Baker DC, McCarthy JG, Mufarrij A. Congenital infiltrating lipomatosis of the face: Clinicopathologic evaluation and treatment. Plast Reconstr Surg 1983;72:158-64. Bouletreau P, Breton P, Friedel M. Congenital infiltrating lipomatosis of the face: Case report. J Oral Maxillofac Surg 2000;58:807-10. Weiss S, Goldblum J. Enzinger and Weiss's Soft Tissue Tumors. 4 th ed. St Louis: Mosby; 2001. p. 571-641. De Rosa G, Cozzolino A, Guarino M, Giardino C. Congenital infiltrating lipomatosis of the face. J Oral Maxillofac Surg 1987;45:879. Van Wingerden JJ, Erlank JD, Becker JH. Liposuction for congenital infiltrating lipomatosis of the face (Letter). Plast Reconstr Surg 1988;81:989. Donati L, Candiani P, Grappolini S, Klinger M, Signorini M. Congenital infiltrating lipomatosis of the face related to CMV infection. Br J Plast Surg 1990;43:124-6. Macmillan AR, Oliver AJ, Reade PC, Marshall DR. Regional macrodontia and regional bony enlargement associated with congenital infiltrating lipomatosis of the face presenting as unilateral facial hyperplasia. Int J Oral Maxillofac Surg 1990;19:283-6. Bataineh AB, Mansour MJ, Abalkhail A. Oral infiltrating lipomas. Br J Oral Maxillofac Surg 1996;34:520-3. Kang N, Ross D, Harrison D. Unilateral hypertrophy of the face associated with infiltrating lipomatosis. J Oral Maxillofac Surg 1998;56:885-7. Gorken C, Alper M, Bilkay U, Celik N, Songür E. Congenital infiltrating lipomatosis of the face. J Craniofac Surg 1999;10:365-8. Unal O, Cirak B, Bekerecioglu M, Kutluhan A, Ugraº S, Tali T. Congenital infiltrating lipomatosis of the face with cerebral abnormalities. Eur Radiol 2000;10:1610-3. Padwa BL, Mulliken JB. Facial infiltrating lipomatosis. Plast Reconstr Surg 2001;108:1544-54. Kamal D, Breton P, Bouletreau P. Congenital infiltrating lipomatosis of the face: Report of three cases and review of the literature. J Craniomaxillofac Surg 2010;38:610-4. Aydíngöz U, Emir S, Karlí-Oðuz K, Köse G, Büyükpamukçu M. Congenital infiltrating lipomatosis of the face with ipsilateral hemimegalencephaly. Pediatr Radiol 2002;32:106-9. Unal S, Demirkan F, Arslan E, Cinel L. Infiltrating lipomatosis of the face: A case report and review of the literature. J Oral Maxillofac Surg 2003;61:1098-101. Malik A, Jagmohan P, Thukral BB, Khanna G, Rajni. Congenital infiltrating lipomatosis of the face and neck. Acta Radiol 2004;45:556-60. Heymans O, Ronsmans C. Congenital infiltrating lipomatosis of the face. Eur J Plast Surg 2005;28:186-9. Haloi AK, Ditchfield M, Penington A, Philips R. Facial infiltrative lipomatosis. Pediatr Radiol 2006;36:1159-62. 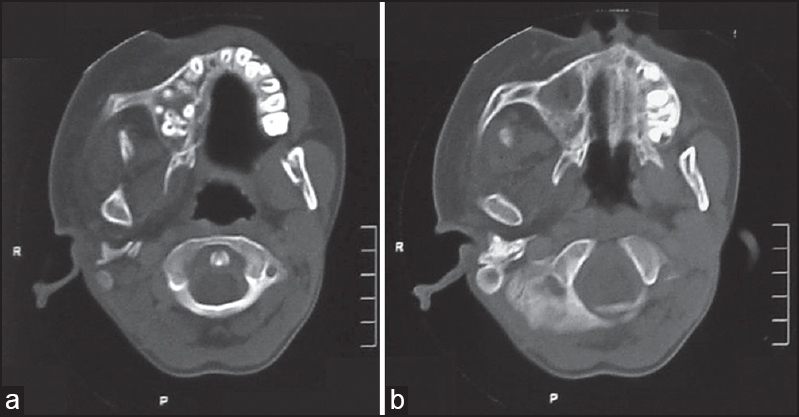 Haloi AK, Ditchfield M, Penington A, Phillips R. Congenital infiltrating lipoma with intrabony invasion into maxilla. Korean J Oral Maxillofac Radiol 2007;37:111-5. Pires Fraga MF, Mello D, Jorge D, Perin LF, Helene A. Congenital infiltrating lipomatosis. J Plast Reconstr Aesthet Surg 2009;62:e561-4. Alkan O, Yildirim T, Seyhan T, Erbay G, Erol I. Congenital infiltrating lipomatosis of the face with hemimegalencephaly. Neuropediatr 2009;40:141-3. Kim JE, Gottschall, Bachman RP, Nemzer L, Puligandla B, Schaeur G. Facial infiltrating lipomatosis: Physical, radiological and histopathological findings. Arch Otolaryngol Head Neck Surg 2010;136:301-3. Maruyama K, Okumura A, Negoro T, Watanabe K. Congenital infiltrating lipomatosis of the face with ipsilateral hemimegalencephaly, band heterotopia, and hypertrophy of brainstem and cerebellum. Neuropediatr 2010;41:147-50. Rajeswaran R, Murthy J, Chandrasekharan A, Joseph S. Case report: Congenital infiltrating lipomatosis of face. Indian J Radiol Imaging 2008;18:306-9. Patel RV, Gondalia JS. Congenital infiltrating lipomatosis of the face (Comment Letter). Br J Plast Surg 1991;44:157-8. Waite KA, Eng C. Protean PTEN: Form and function. Am J Hum Genet 2002;70:829-44. Salvatore C, Antonio B, Vecchio WD, Lanza A, Tartaro G, Giuseppe C. Giant infiltrating lipoma of the face: CT and MR imaging findings. Am J Neuroradiol 2003;24:283-6.